Friday the 30th of June was not a normal Friday, it was Fast! 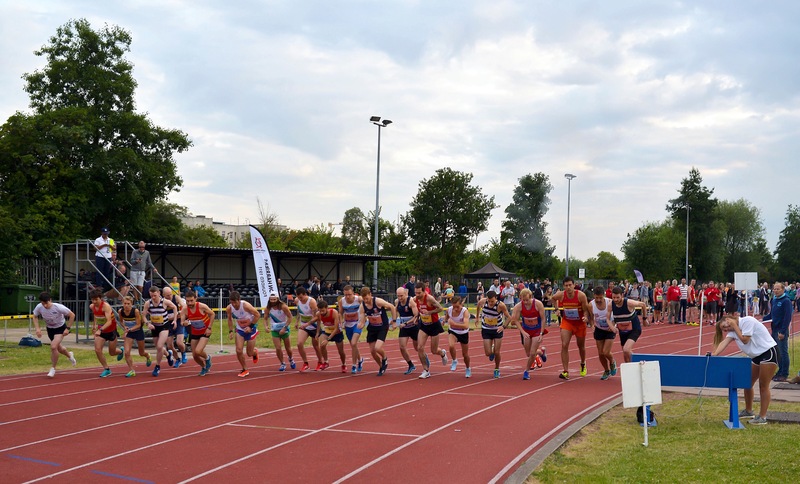 Barny Foot and the Orion Harriers organised the event at Walthamstow Track, inviting runners to take part in the 10,000m or 5,000m. Inspired by events such as Night of the 10,000m PBs supporters were encouraged to cheer from lane 3, motivational signs were placed around the track and food stalls were nearby. 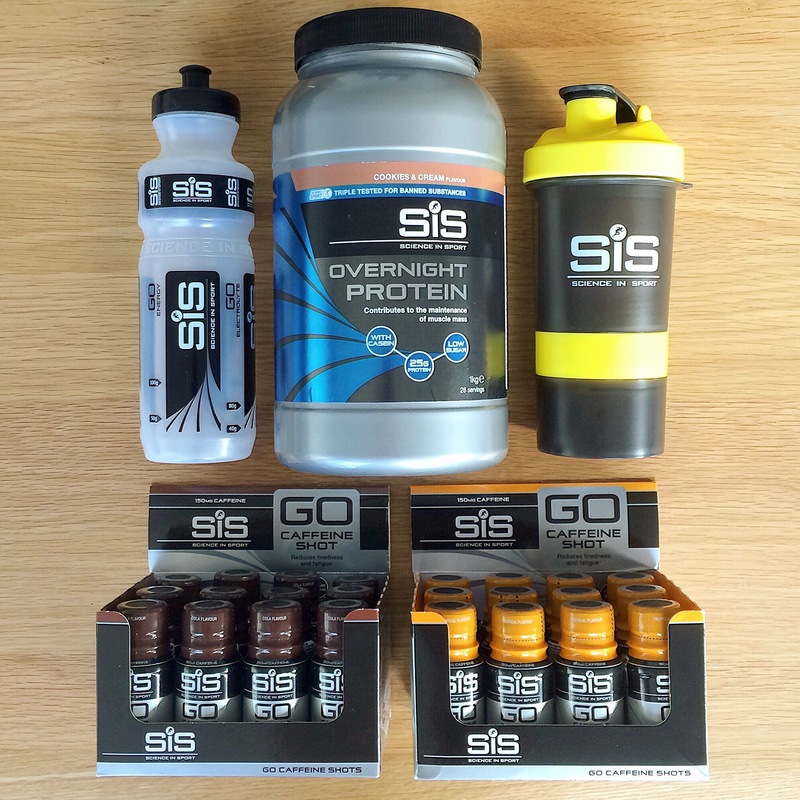 Add to that, pacemakers, prizes, sports massage and beer, Barny had organised a great event. I was taking part for the second year in a row as I had achieved a PB in 2016 thanks to a competitive race and the supportive atmosphere. Having just started training with the Suunto Training Squad I thought it would be a good race to show my coach, Andy Walling, what sort of shape I was in. Off the back of completing the Boston Marathon in April training had been going well and I was confident I was in PB shape. After the sufferfest of Night of the 10,000m PBs I wanted to prove to myself that I could pace a 10,000m well and achieve a decent time. Heading to the track from work I was excited to see what I could do. I love racing, I really enjoy seeing what I can get out of myself on any given day. Arriving at the track I bumped into James Brewster & Jon Brombley. 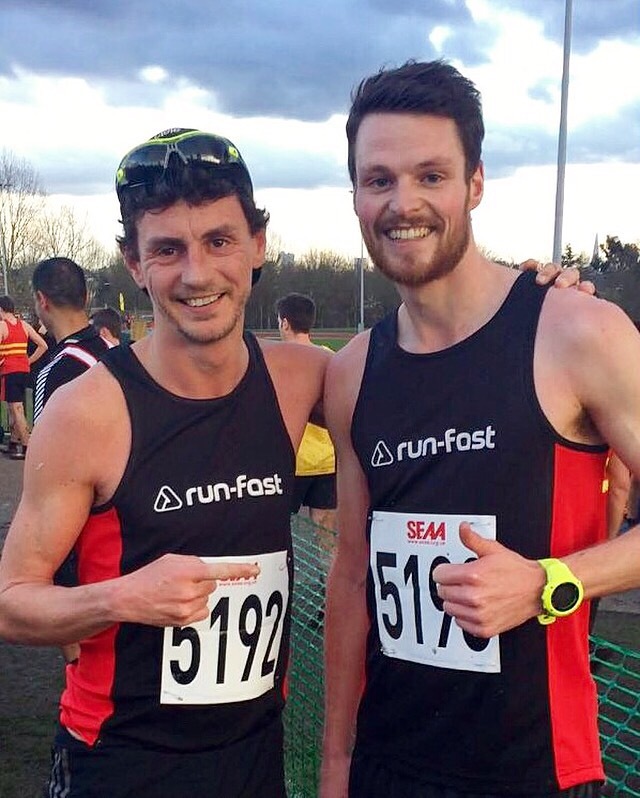 Jon was taking part in one of the 5,000m races, it was great to cheer him on and see him achieve a shiny new personal best alongside Anna Boniface. As I had completed a tough session midweek for the Suunto Training Squad I wasn’t sure how my legs would react to running around 3:30min/km pace but I decided to start there and see if I could crank it up in the second half of the race. Initially there was a group of 8 or 9 of us around that pace but after a few laps 5 or so runners pushed on. 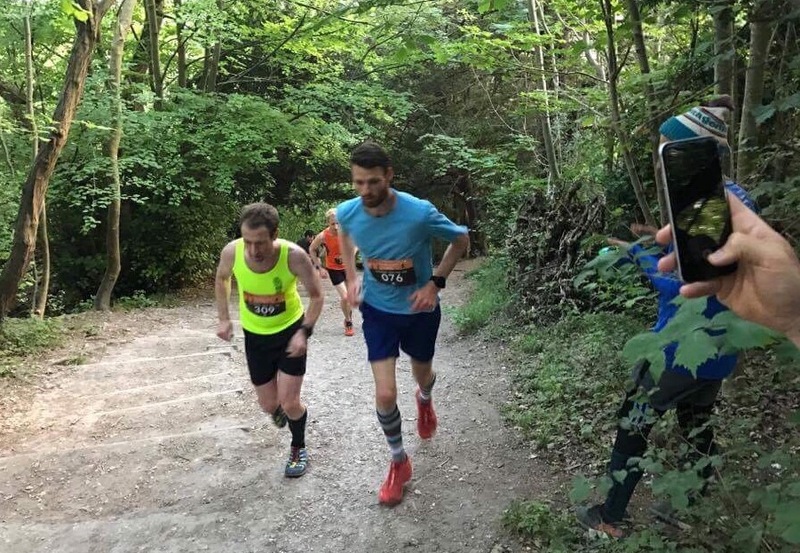 This included friend Mark Boulton who said he was aiming for sub 35 minutes, I knew he was ahead of schedule and so planned to keep him in view and try to close up on in the second 5,000. 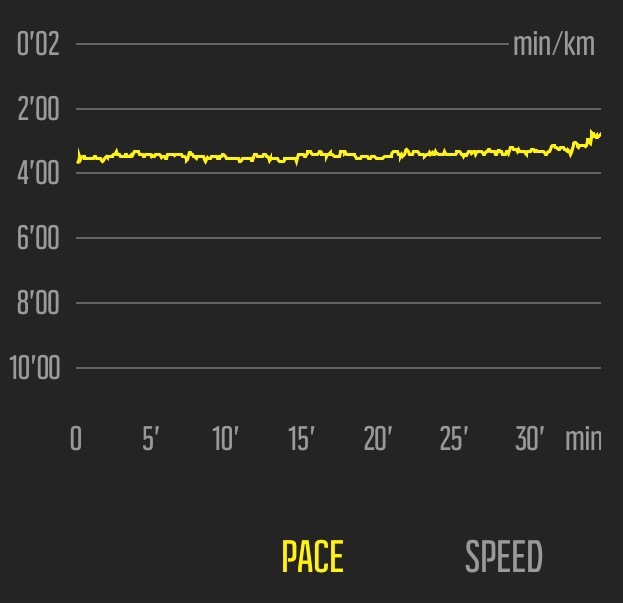 It took me a few kilometres to get into my stride but after 4k I was feeling comfortable and relaxed. With 3k to go I started to increase the pace. I was between 3:30 and 3:25 up until that point but was feeling good and the crowds on the home straight were spurring me on. I overheard one supporter say “oh, that’s Skinner. 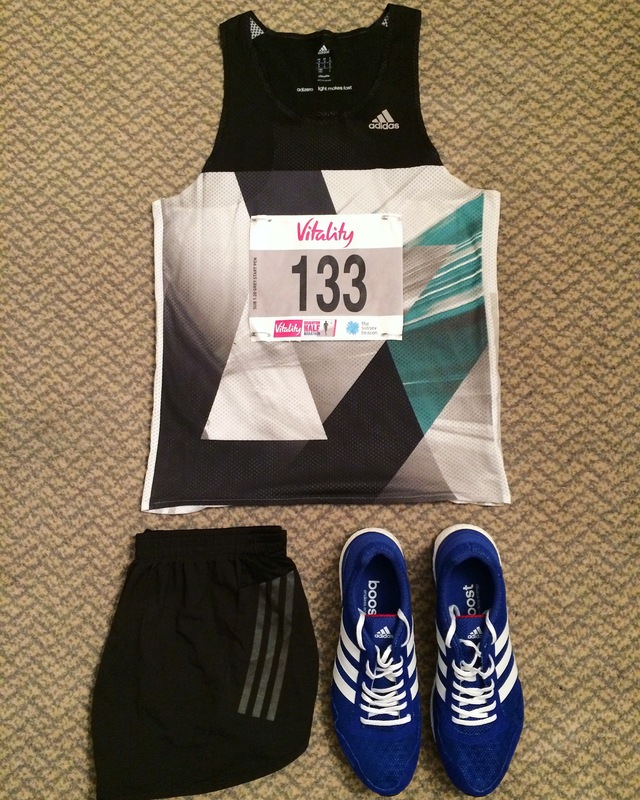 He “ran” at Night of the 10,000m PBs.” it reminded me of my poor showing in that race and made me want to show what I’m really capable of and push on. I was dropping a few of the runners that were alongside and started moving closer to Mark. I was a few hundred metres behind him with about a mile to go. I figured I’d probably left it too late to overtake him but I wanted to see how close I could get and knew I’d scrape a PB if I crossed the line just behind him. After running the Strava Mile a few weeks prior to the 10,000m and having completed some tough track sessions I knew I could push it over the final kilometre. I clocked 3:10 for the last kilometre and crossed the line in 6th in 34:47 (three seconds quicker than last year). Overall, I probably should have upped my pace a little earlier as I felt good at the line. However, I was really happy to achieve a marginal PB and have taken confidence from the fact I felt so strong. I really want to run more track races, after the London Marathon next year I think I will focus on shorter distance races for a while in a bid to improve my speed. Well done to everyone else that achieved personal bests that night, a staggering 68% of runners did just that. Thank you to everyone that cheered me round the track and to those of you that wished me good luck. A massive thanks has to go to Barny Foot for organising such a great event. I will definitely be back next year as long as the race schedule allows it and I recommend that more of you get involved. 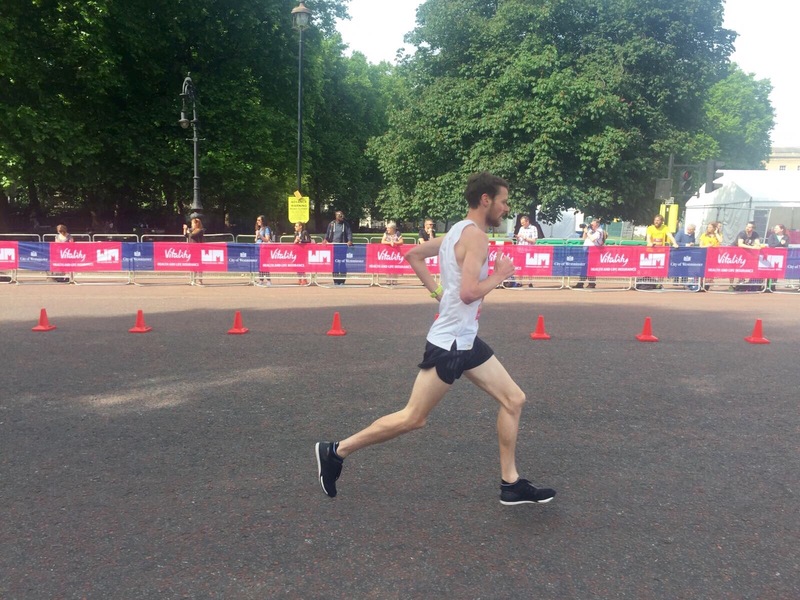 On Saturday the 24th of June I took part in the Salomon Sunset Series London 10k. I always keep an eye on Salomon Running on social media because their kit is great, they create some awesome videos and sponsor many of the best trail/ultra-runners. 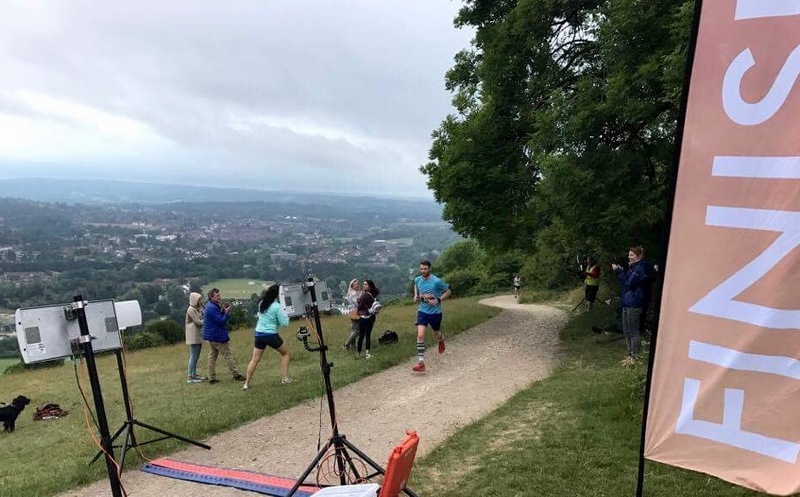 When they announced they were organising the Sunset Series a few months back I was really keen to get involved because I’d never ran around Box Hill, I knew some friends would be taking part and with OCC coming up I need to get some hills in. I was lucky enough to be offered a free place as I have reviewed some Salomon shoes in the past and I’ve recently been selected to take part in the Suunto Training Squad. 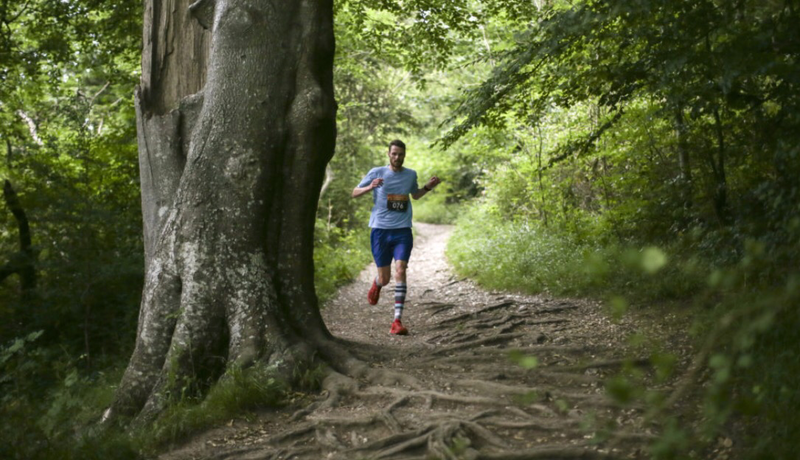 I was really looking forward to the event but knew that it would be a big challenge as I took part in the Orion Fell Race in Epping Forest on Friday night. The 5k included 900+ft elevation gain. I finished 7th in 22:20 knocking 48 seconds off the time I ran in 2015, my legs were not happy. During the day Lorna and I travelled east to have lunch with friends. It was nice to catch up with Ben and Maz and meet Will, Hayley and baby Jackson. Late afternoon I started my journey across London to Box Hill. I bumped into Mollie and Frankie on the train, it was good to have a catch up and speculate how tough the event would be. 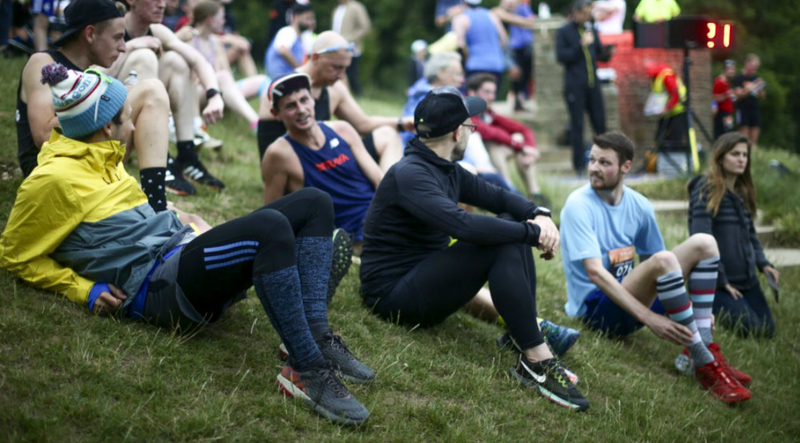 We arrived at Box Hill an hour or so before the start meaning we could have a good chat with some of the Advent Running/Adidas Running lot, sort our race kit and drop bags. Throughout the afternoon Salomon had been putting on trail workshops and Q&As, it was cool to hear from Max Nicholls about his training, racing and goals. To loosen my legs up a bit I did a few strides before listening to the briefing and positioning myself near the front in the start pen. Knowing the 10k course included 250m+ of elevation gain I took it relatively steady off the line; I wanted to keep the lead pack in view but was confident that I would be able to move through the field once we got to the hills. Having not taken part in many trail races recently I was excited to tackle the challenging course and I enjoyed the fact I didn’t need to look at my watch as I wasn’t aiming for a time. After 2k of running on the flat I arrived at the first hill, we gained 60m in 500m then from 3k to 3.7k we ran up another 100m. Thanks to the OH Fell Race my legs were tired but strong at the same time; I managed to overtake quite a few runners on the first couple of hills and was feeling good and enjoying the descents. From 7k to 8.5k there was a really nice smooth downhill section where I let my legs go. With more than a kilometre to go though I knew there would be another sizeable climb. There was a U-turn at the bottom of the hill to pretty much go straight back up again. The final big hill was really demoralising as it was open, you could see the brow of the hill from the bottom and couldn’t help but long to be at the top with the click of your fingers. I could see two runners up in front and used them as motivation; with some words of encouragement from JP who was descending parallel to me I got my head down and refused to slow to a walk. Once at the top of the climb the last 500m or so was pretty flat. I crossed the line in 45:04, surprisingly in 3rd position. Overall the race was a lot of fun; I definitely need to run more trail races. After grabbing my wooden coaster, bottle of water and clif bar we cheered in the rest of the runners. In the next few months I am going to try and make it a priority to run more trails and venture further out of London. If you haven’t given trail running a try I would definitely recommend one of the Salomon Sunset events, fingers crossed they’ll be around next year and more people will get involved. 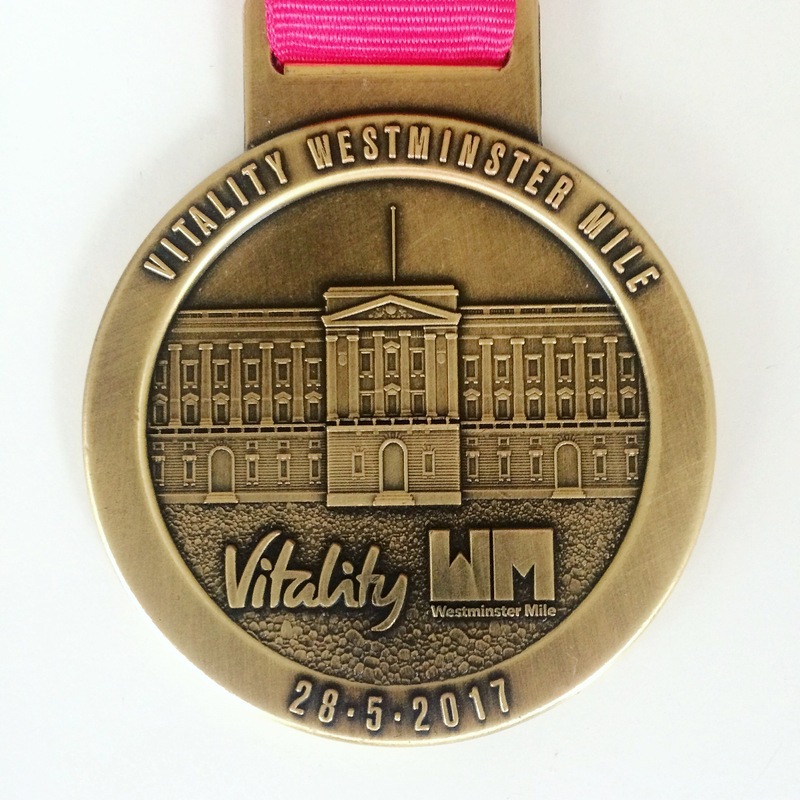 On Sunday the 28th of May I took part in the Westminster Mile. 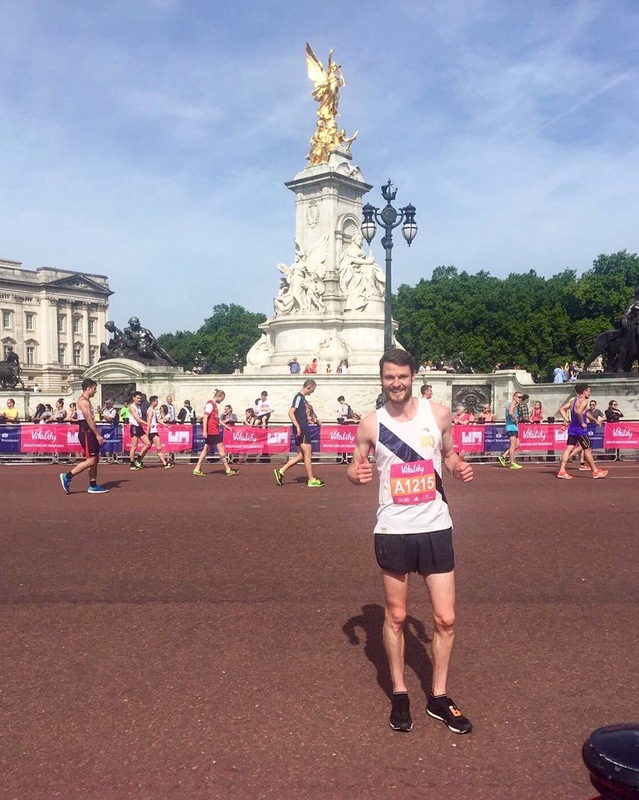 Having done it in 2015 I was looking forward to running up the Mall and crossing the finish line near Buckingham Palace again. The first time I took part in the event I didn’t know what time I would be capable of so ended up in the B race. I was in good shape and ran 5:05 which meant I lead the race from start to finish and took the tape. It was fun being at the sharp end of a race but on reflection had there been someone to chase I could well have dug a little deeper and scraped sub 5. 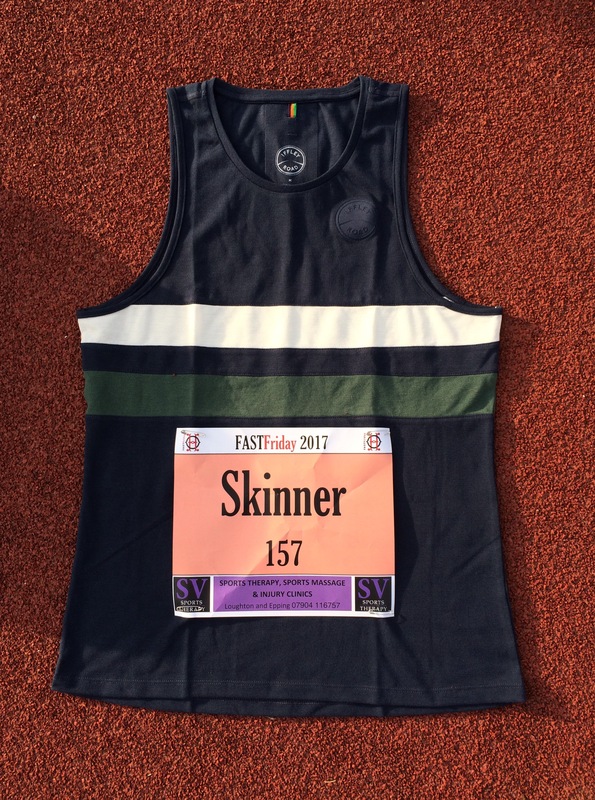 With that lesson learnt signing up for this year I predicted I would run nearer my PB of 4:44 (achieved in the City of London Mile last year, thanks to some “pacing” from Ken Hoye) to get in the A race and have people to compete with. 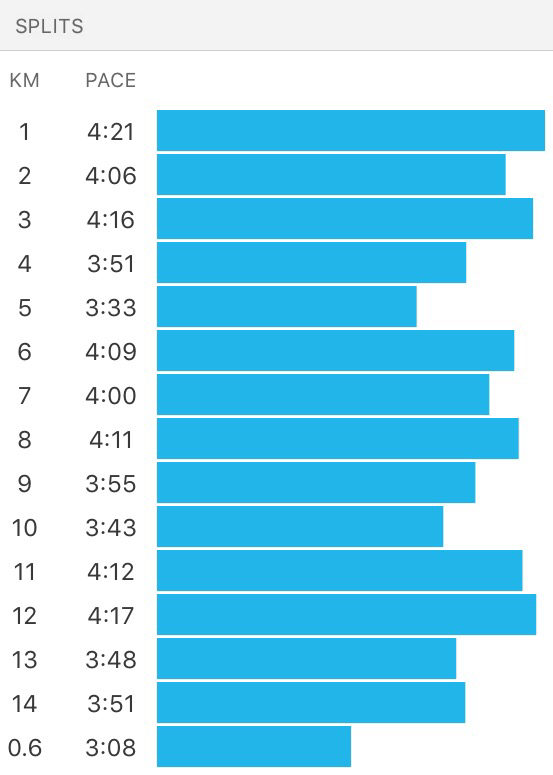 With the sufferfest of Night of the 10,000m PBs still vividly in my mind I decided to take it easier in the couple of days leading up to the mile. I did a steady 8k run commute on Friday and swam with Lorna on Saturday morning to loosen the legs up. The A race started at 9:30am so we took the bus to get there around 9am, this gave me time to sort race kit and take an SIS GO Caffeine shot. I opted to try the Cola flavour; it tasted good and perked me up. I did a few strides and then made my way to the start pen. Hugh Brasher gave a speech and there was a minute silence before the start to commemorate the victims of the Manchester attack on Monday. Something I was annoyed about was the fact that one runner had turned up late and was shuffling his way through the start pen while everyone else was observing the minutes silence. There are more important things than running, show some respect! Hugh Brasher set us on our way. 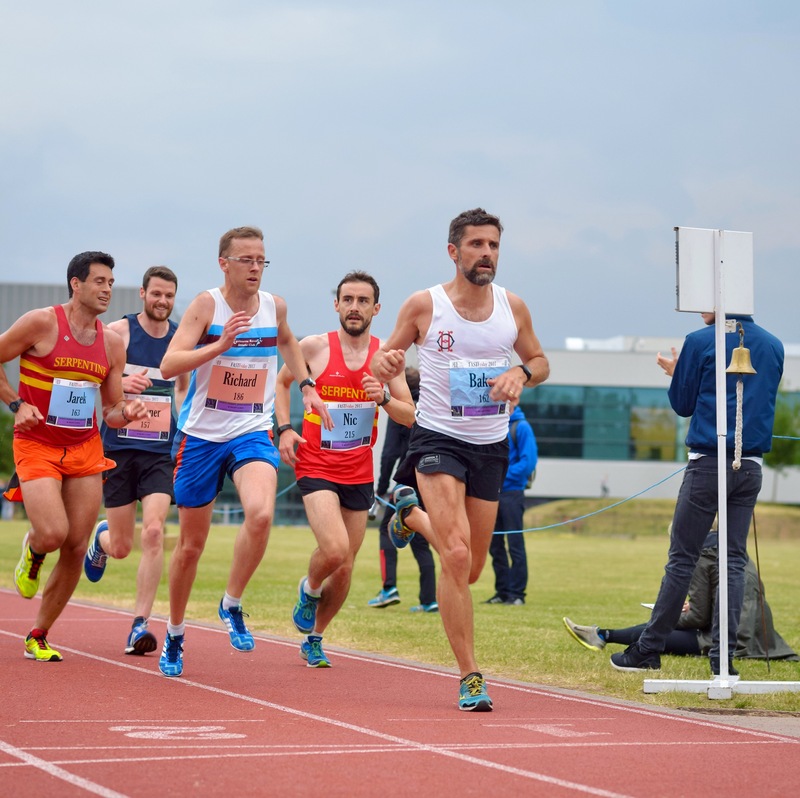 I was a couple of rows back from the start line so I was a little boxed in but was thinking “get up to speed, find some space and then push in the second 800m”. To overtake a few runners I went wider around the bend than I would’ve liked getting on to Horse Guards Road. Once I’d found some space I was feeling good, I glanced at my watch to check I was running sub 3min/km pace to finish in under 5 minutes. I passed the 800m to go sign and upped the pace; I had a few runners to chase which was good. 400m to go: my legs were burning and I was breathing HEAVY but I was on target. I turned the corner onto the home straight, I saw the clock showing “4:30 something”, I knew I’d gone sub 5 again. I sprinted through the finish, crossing the line in 4:48 in 20th position. 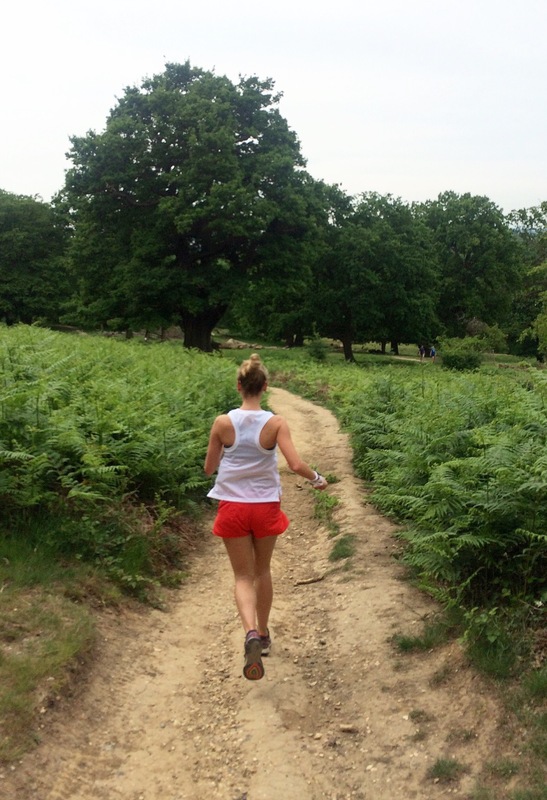 After finishing the mile Lorna and I headed to Richmond Park for a steady 15k run. Lorna is using a coach at the moment, focusing on her form and doing easy trail runs before the mileage cranks up ahead of the Great East Run in September, I’m excited to see how much quicker she gets. 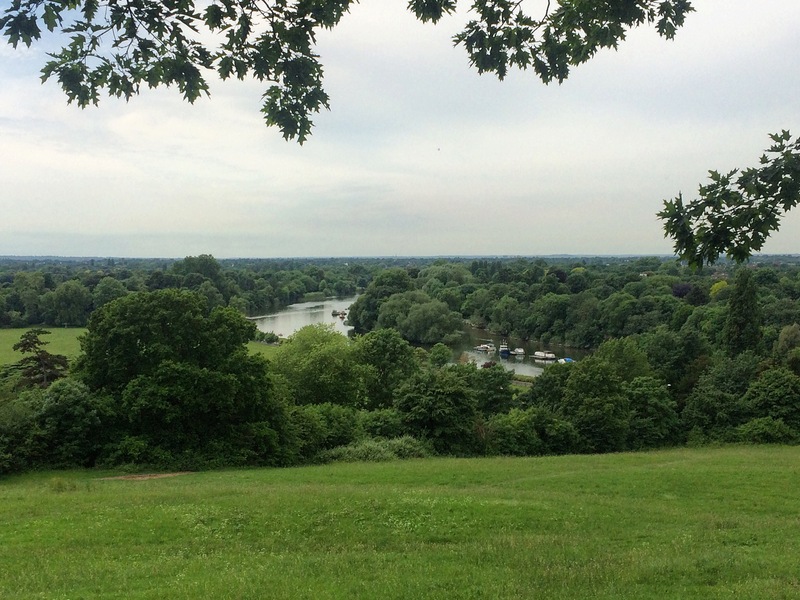 It’s been really nice to run around Richmond Park the last couple of weekends, there’s no stress about the pace and it’s good to get off the roads especially with OCC coming up at the end of August. June is going to be a pretty busy month for me. 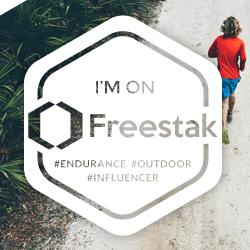 I have: Orion Forest Five, Endure 24, Strava Mile, LBH relays, Orion Fell Race, and the Orion Fast Friday (10,000m). 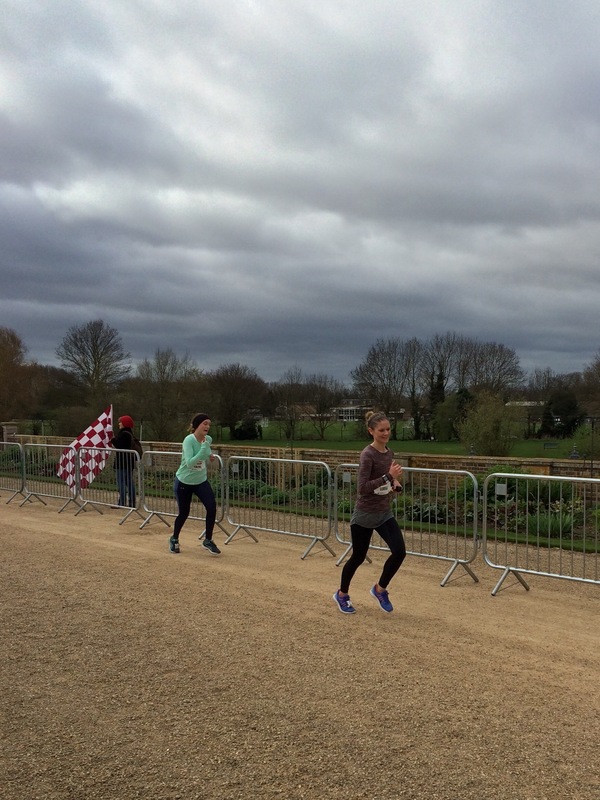 On Sunday the 19th of March I took part in the Hampton Court Palace Half. I signed up because Lorna, her sister Rachel, Marie (Lorna’s manager) and her husband Quentin had decided to run. 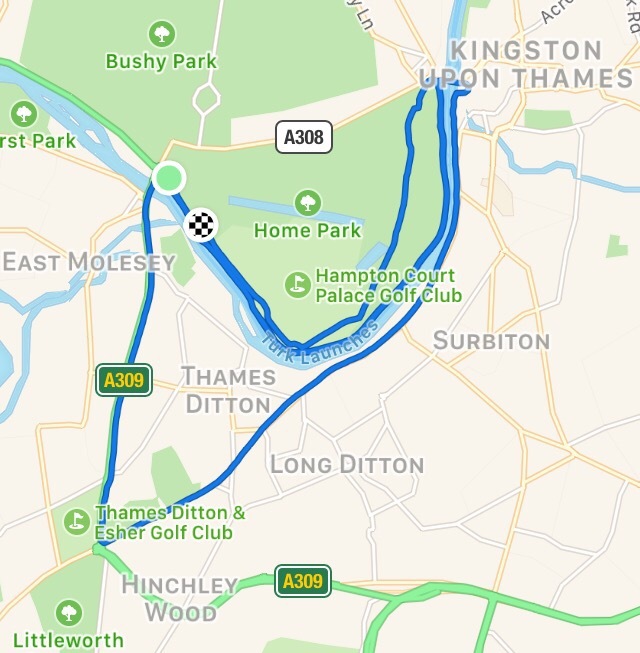 As the race was organised by Run Through I knew it would be good, I was looking forward to running along the river and finishing just outside Hampton Court Palace. I didn’t really have a race plan as I knew my legs would be tired from the Escape to trail run, organised by Dean, on Saturday. Despite the trail run I thought it would be good training to see how quickly I could get round. At the end of the day in Boston I will no doubt get to a point where my legs are feeling heavy and need to try and hold on to a decent pace. We woke up at around 6am on Sunday morning so we could enjoy breakfast and get organised. Furthermore, we wanted to leave ours at 7am to make it to the palace in good time to park the car and walk to the race village. Lorna and Rachel were excited to see what time they could achieve. Rachel hadn’t raced since the London Marathon 14 years ago but had increased her mileage well over the few months before the race so we were all pretty confident she would run well. Ideally she wanted to beat Phil’s time of 1:43 from Colchester Half the previous weekend. We bumped into Tom (@tom.runs) and had a catch up before dropping our bags off. I headed to the start line and had a quick chat with Joe while we positioned ourselves near the front. Off the start I went out pretty quickly, I was through the first kilometre in around 3:35 (75 minute pace) alongside Joe and a handful of others. I knew I wouldn’t be able to hold that pace for long but decided to go with it and see what happened. I stayed with the group for a couple of kilometres but then I started to open up a little gap, first place was no longer visible but I could still just about see second place. I decided I was going to try and stay in third place and keep him in view for as long as possible. My legs were already feeling pretty heavy and tight from around 5k but I could still hold a decent pace, I was around 3:40-3:45 pace at this point. I knew it was going to be a long 16k but I wanted to have to dig deep and test the legs. As I was on my own it was tough going especially running into the wind along the river. I didn’t turn around at all to see if I was being caught but when running past big crowds I could hear how close the runners were behind me. The support along the river was great. Going from running on concrete to running on the towpath my legs were not happy especially having been on my feet for 4 hours, running 27k the previous day. I was relieved to make it to within 5k from the finish line and knew I could suffer for just less than 20 minutes to get it done. The final few kilometres were into the wind, which wasn’t great, but I just couldn’t wait to see the finish line and the palace. With 800m or so to go someone let me know there was a runner about 30m or so behind me, I upped my pace a bit to make sure no one was going to overtake me and then I was on the home straight. I crossed the line in 1:18:55 in 3rd, job done. I cheered Tom, Hanif, Lorna, Rachel, Marie & Quentin through the finish. Lorna and Rachel smashed it finishing in 1:42 to beat Phil’s time. We went for a nice roast and then chilled for the rest of the day. 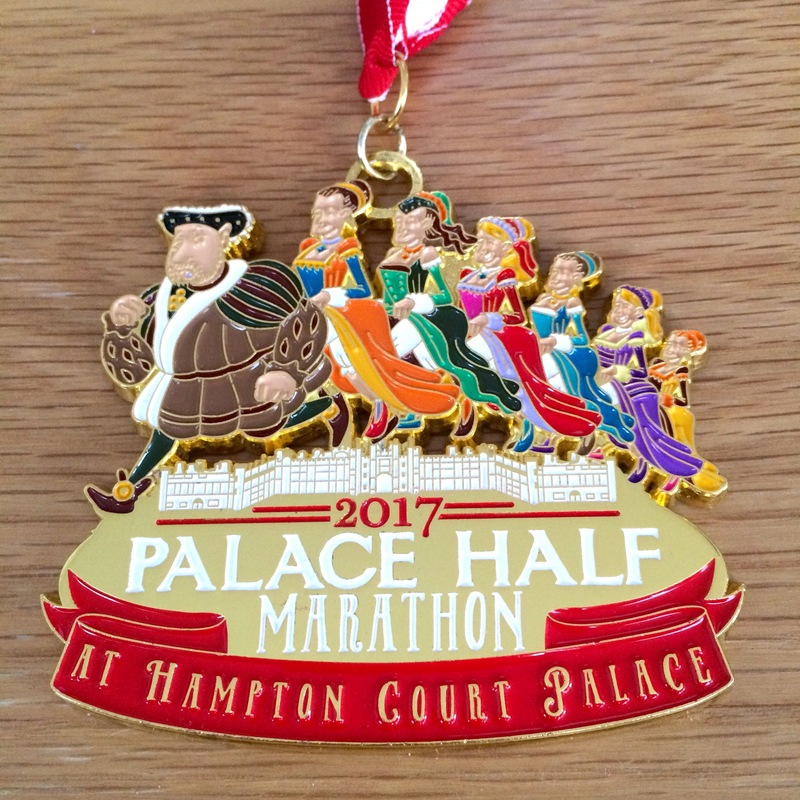 Overall it was a great day, if you’re looking for a quick scenic half next year I’d definitely recommend considering the Palace Half. The route was scenic and relatively flat, the crowds were good and the medal was cool (as to be expected from a Run Through event). 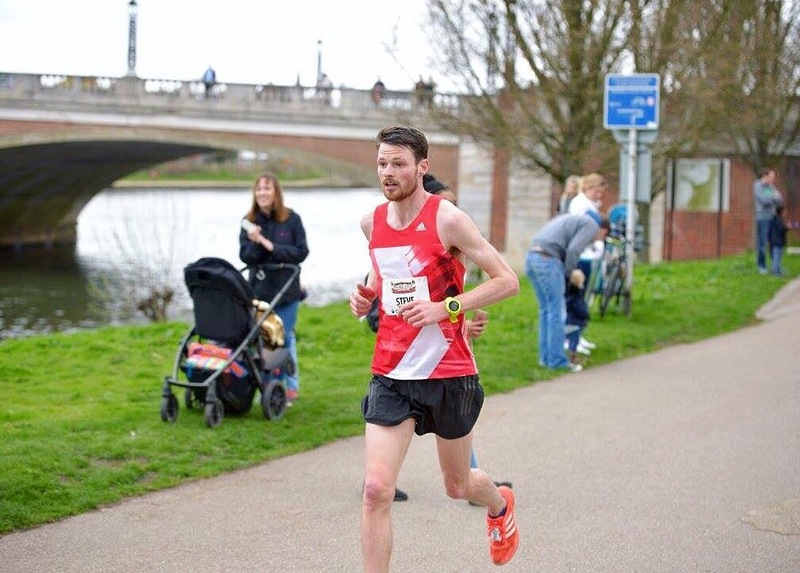 After racing the last four weekends in a row I’m looking forward to doing a steady long run at the weekend before tapering ahead of the Boston Marathon. I hope those of you that raced or had long training runs at the weekend enjoyed it and got the results/times you wanted. I love this time of year when everyone is racing and training hard. It’s inspiring to see so many great performances every weekend. See a lot of you soon. 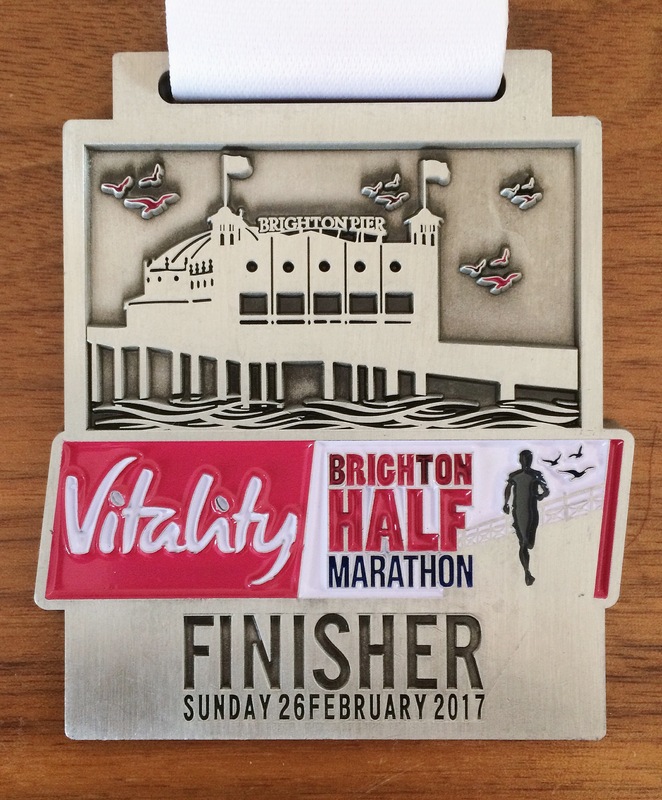 On Sunday the 26th of February I took part in the Brighton Half Marathon. 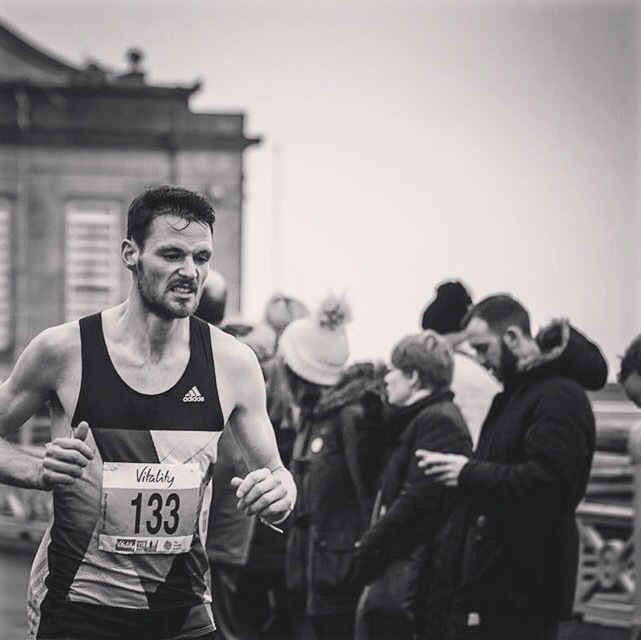 It was my first ‘A’ race of the year and a good opportunity to see where my fitness levels are leading up to the Boston Marathon in 7 weeks’ time. In February last year I ran the Old Deer Park Half Marathon (1:16) before the Cardiff Half (1:13:27) in March. I decided to aim for sub 1:15 in Brighton mainly because I wanted to achieve Championship entry for the London Marathon next year. 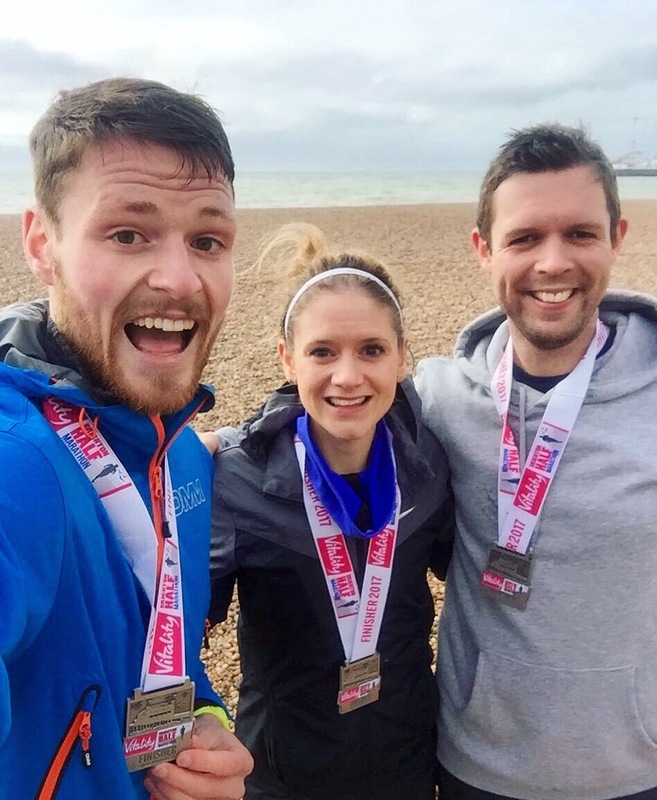 It felt like it had been ages since I’d raced a half marathon properly. 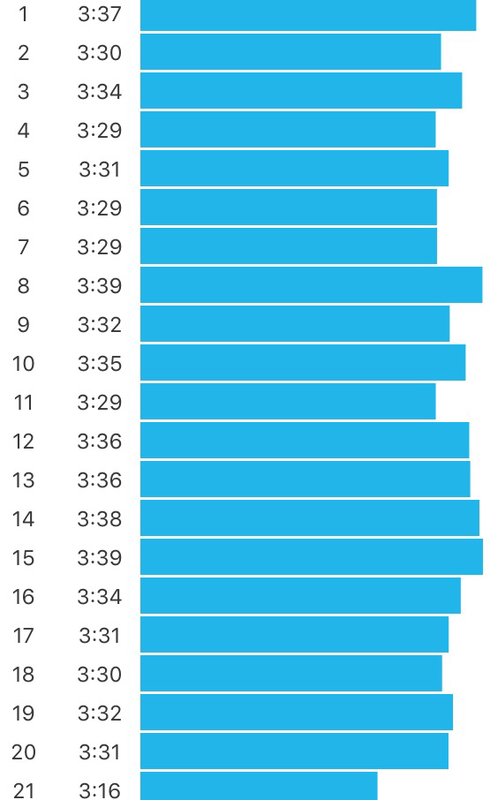 I was excited to see what I was capable of but nervous at the same time as in training for the marathon I’ve either been doing track and tempo sessions (much quicker than HM pace) or long steady runs (much slower than HM pace). 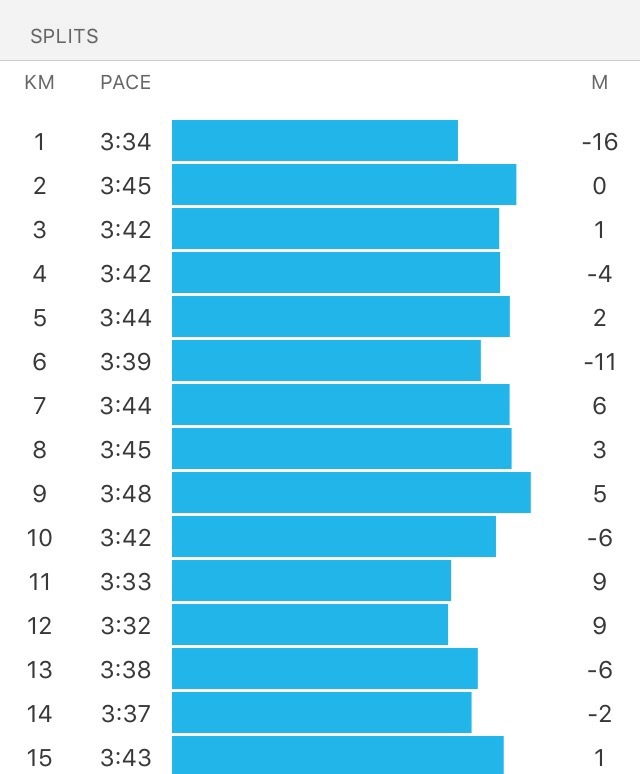 I was worried I wouldn’t be able to hold the pace required to go sub 75 (3:33min/km), however I tried to remind myself that I didn’t train specifically for Cardiff Half last year but felt good then. My girlfriend Lorna, and Alex (one of Lorna’s brothers), had also signed up. We travelled down to Brighton on the Saturday morning so we could relax and do some sightseeing. Once we arrived Lorna and I headed in to town for some food and a look around the shops whilst Alex had a nap. Having only been to Brighton once before, for the marathon, it was nice to explore and go in some of the quirky independent shops. 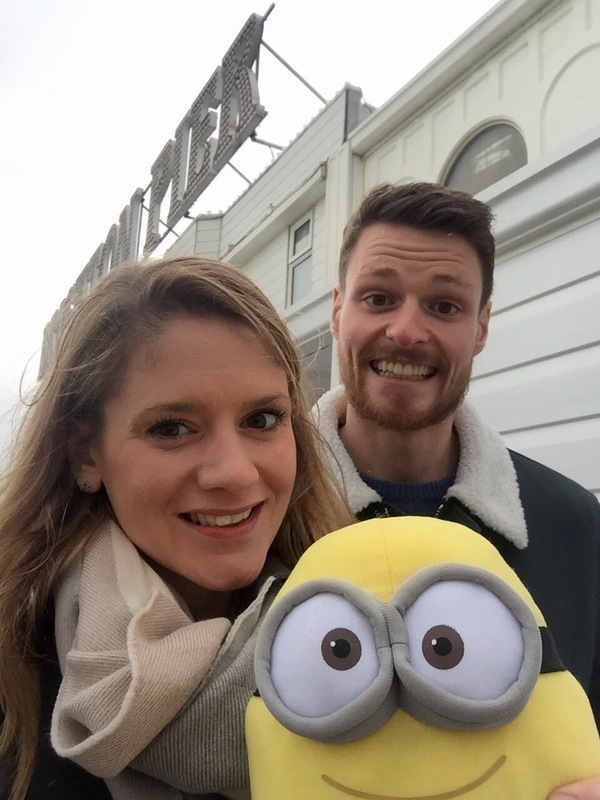 Alex then joined us, despite the cold and windy conditions we walked to the pier to try and win some prizes. 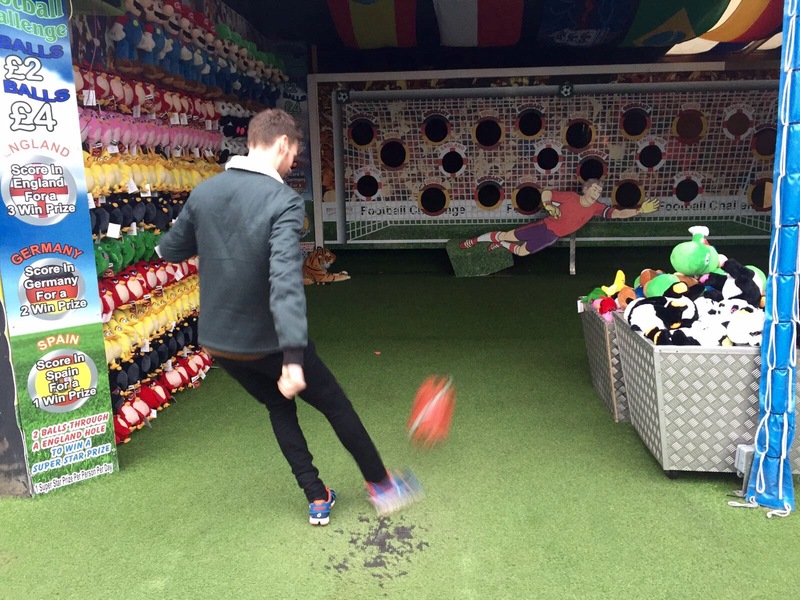 We had a bit of a shocker, Alex and I couldn’t throw for toffee and we weren’t much better with the football. Being competitive I was really annoyed and we decided we’d go back for another attempt after the race. As the weather was rubbish we went for dinner at Bills earlier than planned. Suitably fuelled up we got back to the hotel to prepare our race kit before watching some Saturday night tele and getting an early night. As is often the case on race morning I beat the alarm clock. We were up around 6:30 so we could get ready for breakfast. I opted for toast and a coffee despite being tempted by croissants and all of the nice food on offer. 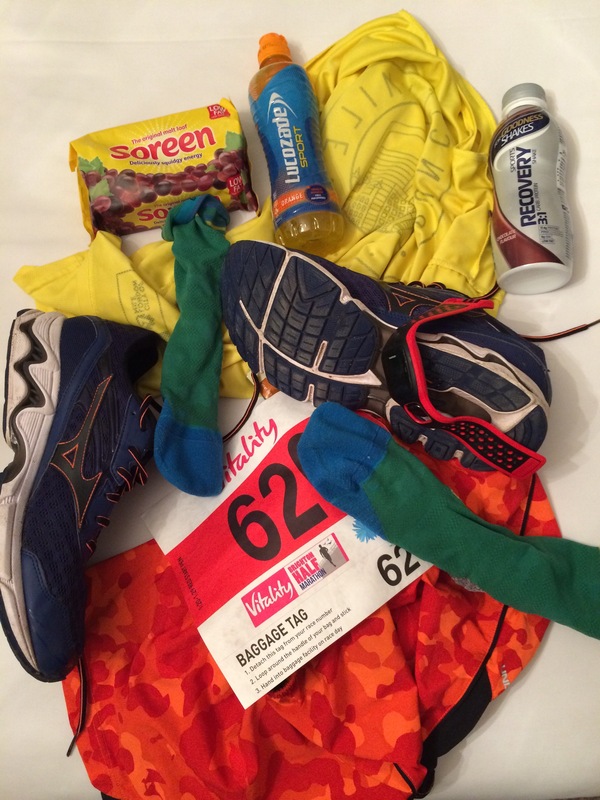 Alex had brought his own slab of Soreen (see pic above), like he’d said the previous day “proper prior planning prevents piss poor performance.” Having woken up nice and early we had plenty of time to don our race kit and make our way down the road to the race village. As we were heading to the hotel door we had our fingers crossed for calm weather, we knew we’d be in for a tough run if the wind was up. It was a bit gusty which was a shame but I guess that was to be expected post Storm Doris and being on the seafront. Having not really looked at where the bag drop was situated on the map, none of us realised we had to walk through the start/finish line and through loo queues. Fortunately we’d given ourselves enough time to get there and negotiate our way back through to the right start pens. I wished Lorna and Al good luck and headed to the sub 1:20 (grey) pen. My legs were feeling fresh after a couple of easy days and the coffee had kicked in, I was ready for the challenge. I caught up with a couple of friends on the start line (Enrique, Dominic and George) and then we were sent on our way. It took a little while for everyone to spread out so the first kilometre was marginally slow. I worked my way past a few runners and was soon tucked in behind George and a couple of others for a few kilometres. It was good to be shielded from the wind for a while and ticking the kilometres off comfortably. 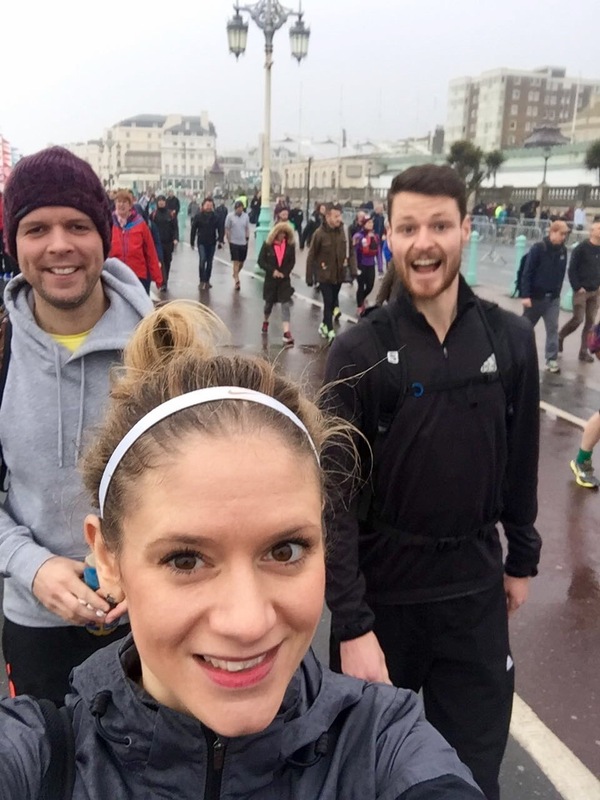 As I previously mentioned I’d run the Brighton Marathon in 2015 so I knew where the inclines and turning points were. We made the turn at mile 4 to start heading back West towards the city centre, unfortunately the wind was against us and we had 5 miles or so to make the next turn. I was still amongst four or five other runners but as we had completed 8k or so they seemed to be dropping pace slightly so I had a decision to make: a) stick with the group for a while and then try to pick up enough time in the final 5k or b) go it alone and try to hold around 3:33min/km pace. I opted for the latter as my legs were still feeling good and there was another group ahead which I thought I could close up on and tuck in behind after a while. Around the 10k point I saw Alex and then Lorna; we gave each other a shout knowing we wouldn’t see each other until the finish. When I’m in the same race as Lorna I always worry about how she is getting on so it was nice to see her looking good and with a decent group around her. I knew she’d run well as her training has been great over the last month or two. I went through 10k in 35:25, not far off my current 10k PB (34:50). It felt quick but my legs were ok, my breathing was a little heavy but that was always going to be the case running into the wind. I kept ticking the kilometres off counting down until the turning point where I’d finally have the wind pushing me to the finish. I had gained on a group of four or five runners and was alongside them between mile 8 and 9. They were slowing up so I went straight past, unfortunately meaning no rest from the wind. The crowds were starting to build, my legs were tiring but I knew I’d soon be on the long home straight. I took the turn at Hove Lagoon, immediately breathing was easier, the wind was at my back and the crowds were making more and more noise. After 10 miles/16k I looked at my watch to start working out how much time I had left to go sub 75 minutes. I figured I had 18 minutes to make it, so if I could maintain my pace or pick it up to closer to 3:30min/km I’d be home and dry. I was soon passing the beach huts along the seafront, my legs were tired and I was just about holding it together. It felt like deja vu as this was exactly how I felt running the same section in the Brighton Marathon. 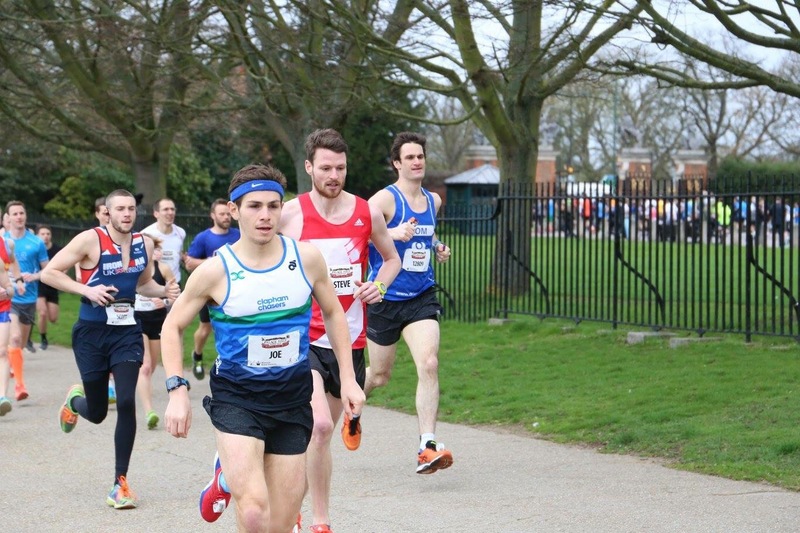 That day I managed to run 3:03 and qualify for the London Marathon through GFA (Good for Age), this time round I was closing in on qualifying for a championship entry. The final few kilometres seemed to last forever; I tried not to look at my watch too much and tried to focus on racing a couple of the runners nearby. The final kilometre arrived. The support was awesome and then with 400m left I could see the clock, it had just ticked into the 1:14s. 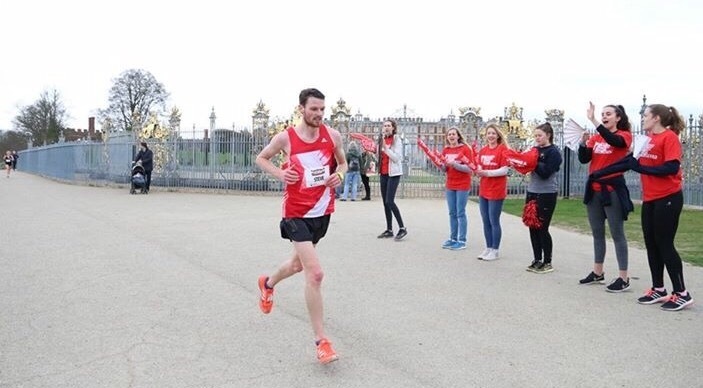 I sprinted through the line knowing I’d achieved my goal: London Marathon Championship entry. Job done! I caught up with George (finished in just over 75 minutes, as part of a long run) and Dominic (71 minutes, well done mate!) and then went to the bag drop to get some warm clothes on. I met up with Alex who’d just crept under 1:30 and Lorna finished in 1:33:55, well inside her target of 1:35. Overall it was a great race for all of us. 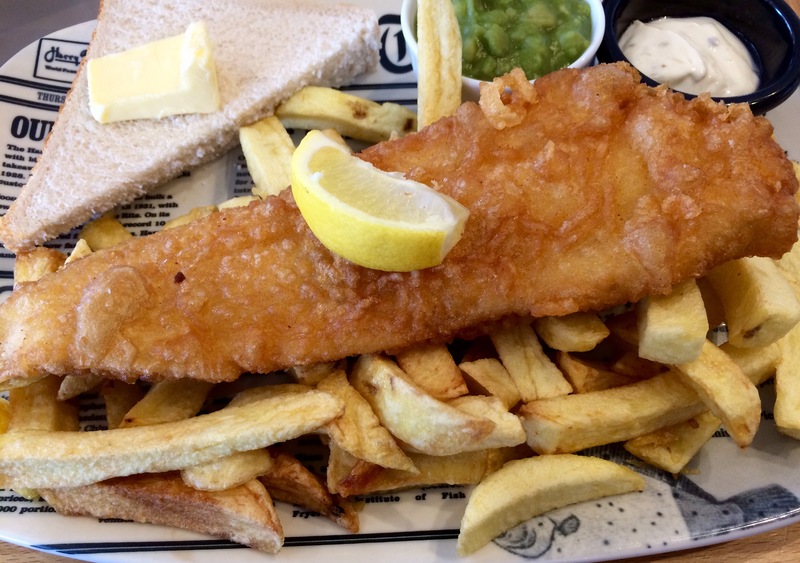 We made our way back to the hotel to freshen up before going to Harry Ramsdens for fish and chips. When you’ve been out in the cold for a couple of hours the hot shower and nice food is so rewarding. As we failed to win anything on Saturday we went to the pier to try our luck again. With the advice of the man running the tin can place, I threw my first bean bag like a dart knocking the bottom right can and subsequently flooring the rest of them, winner! I was handed minion Stevie which I rightfully (unwillingly) handed to Lorna. 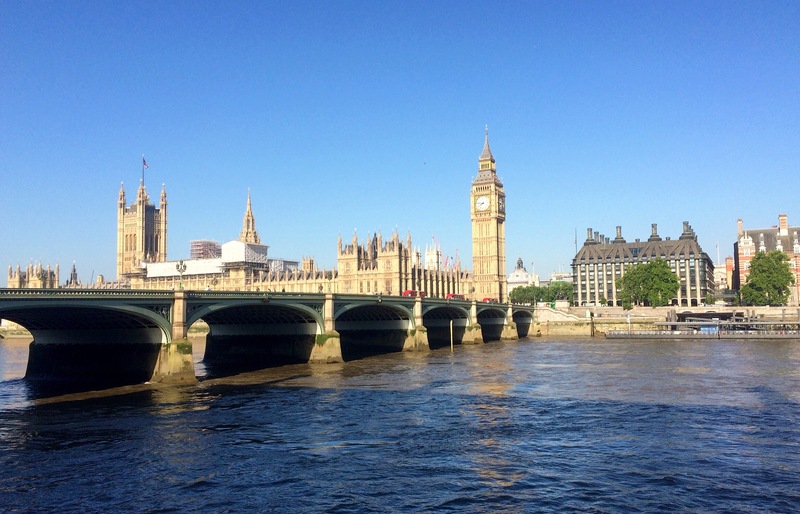 After attempting to eat a couple of scoops of ice cream (so full from fish and chips) we picked up our bags from the hotel and made our way back to London. 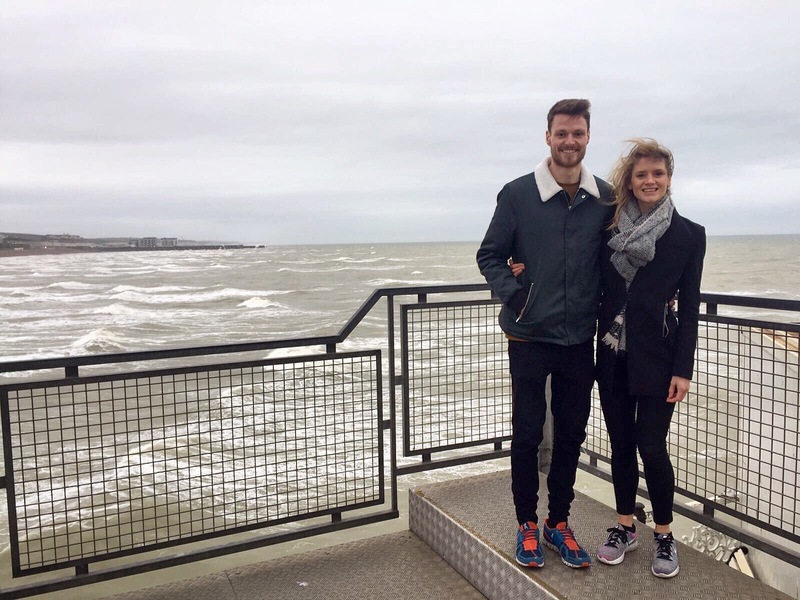 It was a great little weekend in Brighton, over the next few weekends Lorna and I are in Colchester for the Essex 20 miler and Colchester Half. We then have Hampton Court Palace Half before winding down for Boston. I hope those of you that raced over the weekend got your times and enjoyed it. A massive shout has to go to James Poole for smashing Transgrancanaria 360 in 72 hours placing 8th. 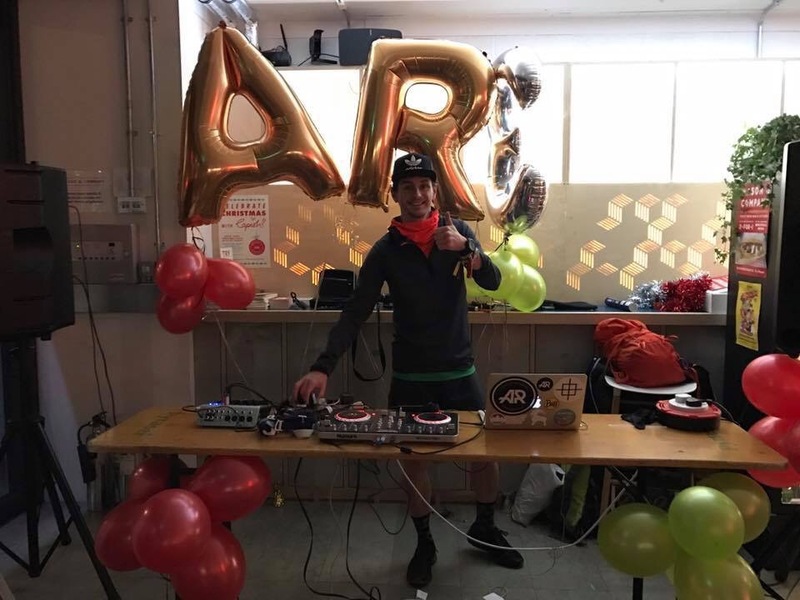 Well done to the Advent Running collective for finishing various transgrancanaria races as well as everyone completing the Tokyo Marathon. I’ve seen some great results posted! 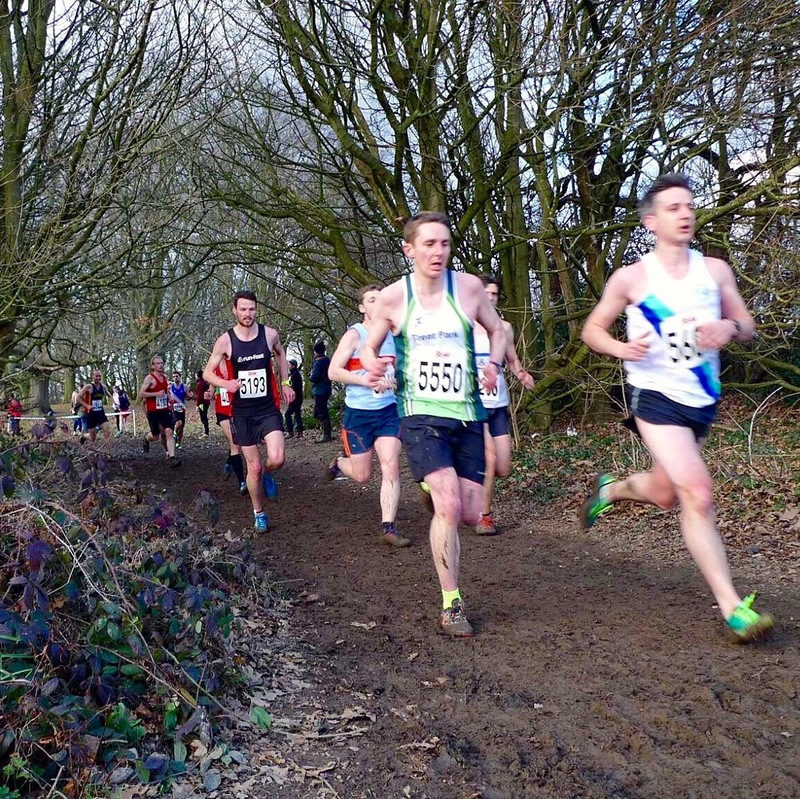 On Saturday the 28th of January I took part in the Southern XC Championships. After watching the race in 2016 I decided I wanted to get involved, mainly because of the challenging course and standard of competition. 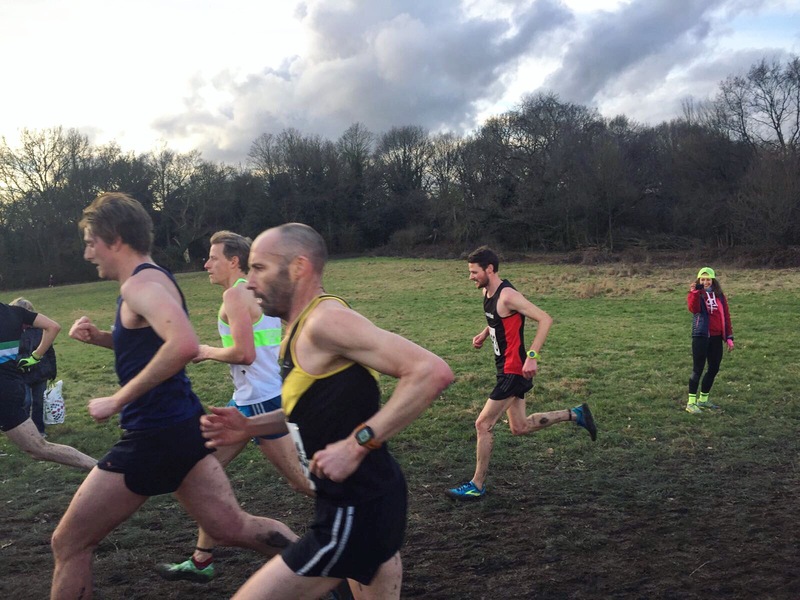 In recent months I have been taking part in the Surrey XC League with Advent Running, it’s been a lot of fun and I’m glad I’d got a few cross-country races under my belt ahead of the 15k of mud on Parliament Hill. 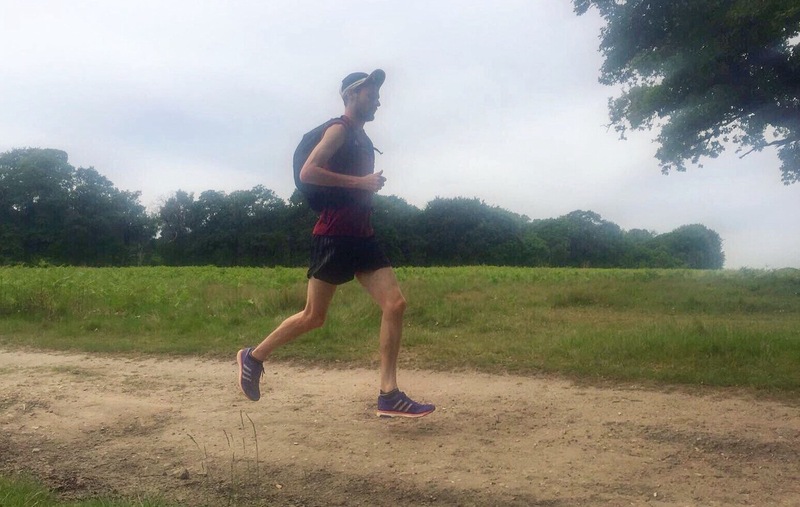 Having only recently started training more seriously for the Boston Marathon I knew I wouldn’t be in great shape to place highly but I wanted to race to gain some strength and enjoy the experience. I had been looking forward to the race since signing up in December. In the week leading up to the race I was keeping a closer eye on the weather than normal, I was wondering whether the course would be super wet and muddy. On the morning of the race I got a bit of a lie in and relaxed, the few hours flew by and I was soon making the trip up to Parliament Hill. With a few friends taking part in the women’s race I arrived at around 1:30pm that gave me time to pick up my race number and chat with the rest of Team Run-Fast. I also met up with the Advent Running group and had a quick catch up before watching the start of the women’s race. The men’s race started at 2:50pm so James Poole and I headed to the registration tent to sort our race numbers and put on our spikes. It was a shame we missed the majority of the women’s race but we did catch the sprint finish from the first four runners. Hannah Walker representing Run-Fast ran well and came third, it’s amazing how quick she is and how she can pull a result like that out the bag after not racing cross-country for a while. James and I ran to the start line. It felt as though I had been looking forward to this race for ages and then all of a sudden it was upon us. I was really excited; it felt as though it was FA Cup final day (I used to get excited about that). I definitely prefer taking part in races with friends and having people around prior to the race to distract me from thinking about every eventuality. We positioned ourselves a couple of rows from the front knowing that there were some seriously quick club runners around us. The gun went off and the herd of over 1,000 runners stampeded up the first big hill. There was so many people lining the course and the noise got louder as you made the climb. It is rather quiet at the beginning near the athletics track but soon the cowbells are ringing in your ears and you’re trying to listen out for familiar voices. With the first hill conquered at “start strong but pace yourself as you’ve got 15k to go pace” you take a sharp right before winding your way down through a particularly muddy section to then tackle a steady longish climb up through some trees. Due to the tough climb a lot of supporters and coaches positioned themselves there to encourage their runners. Some of the AR lot were there to cheer myself and James on and take photos. Having not raced the southerns before I decided I was going to take it relatively steady over the first 5k and then up it if I could for the final 10k. I also figured that being three laps of 5k it would give me a chance to work out which lines were best to take and where you could push the pace and where you had to work hard up the hills. The fact that there was such a big field forced me to take it steady over the first lap; it was especially busy around the first few corners. I really enjoyed the first lap, my legs were feeling good and I was enjoying the variety of the course. Having raced a couple of club races I recognised quite a few faces. It was good to have some friendly competition, I knew if I could stick with them or go passed them I’d have a good race. Whilst on the first lap I was really focussing on where I was placing my feet, there were a few really muddy sections which were tricky to negotiate. Some runners would take a slightly wider route to go around the wet patches whereas other would fly straight through and trust their balance. 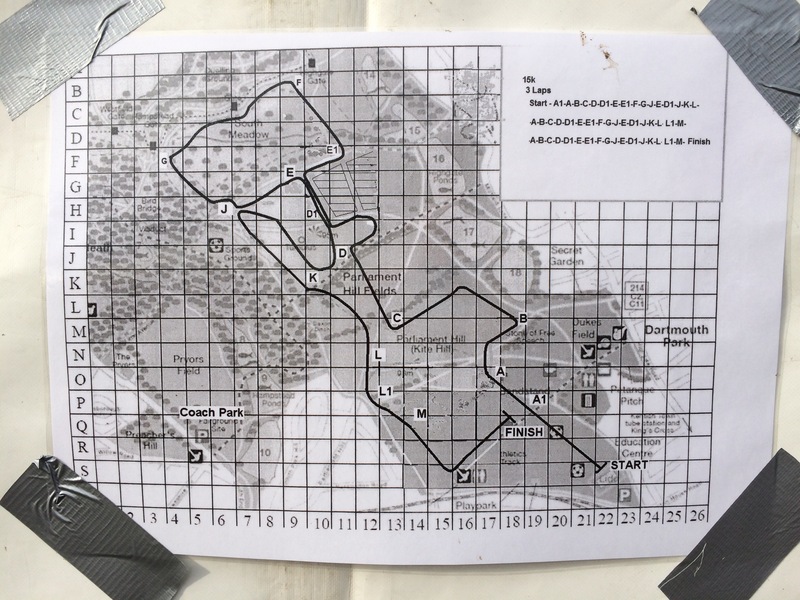 I was still finding my feet and working out which was the best approach for each section of the course. Despite focusing on foot placement I remember thinking “I can’t wait to see Lorna and the Advent Running guys!” They always make so much noise. The group had positioned themselves just before a downhill section to finish the 5k lap. This part of the course was a lot of fun because of the support and the adrenaline from running fast downhill through the mud. It was the perfect position for supporters to be in because it acted as motivation to get round the lap quicker. As well as having the AR guys cheering there was a handful of Run-Fast runners/supporters on the first hill. It was great to have them at that point offering advice and cheering me on, they let me know I was “coasting” and that I should pump my arms and get up the hills quicker. I’m not sure I was coasting but maybe I was holding a little back for the final 5k or so. As everyone had spread out I found the second lap a lot easier than the first. I had locked onto a good pace and could break the lap up into chunks mentally; I worked harder up the hills and let the legs do the work on the nice downhill sections. I was moving up through the field and started to pin point certain runners to catch. 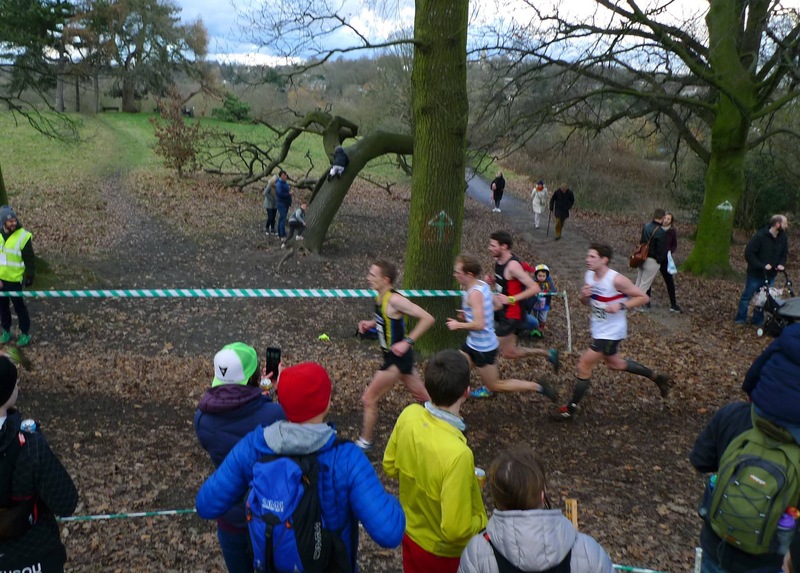 This is what cross-country is all about, there is no point wasting energy/time worrying about the pace or distance you need to knuckle down and race the course and try to finish as highly as possible. After completing the second 5k I was still feeling strong and ready to chase people down. I was making small gains on the climbs but slipped back on some of the downhills. One of the runners I was tracking down was Neil from VPH; we have finished close together on a few occasions. He is really strong in cross-country/fell races in particular and has run the Comrades Marathon on numerous occasions. I knew if I could finish near him or pass him I’d had a decent run. There was a bit of toing and froing as I went passed him on a couple of the hills and he flew passed me on one of the downhill boggy sections. With 2k or so to go I started to increase my pace and then passed Neil with about 1k left, knowing the final section was downhill and then on the flat to the finish I opened up my stride and sprinted to the line overtaking a couple of other runners in the process. 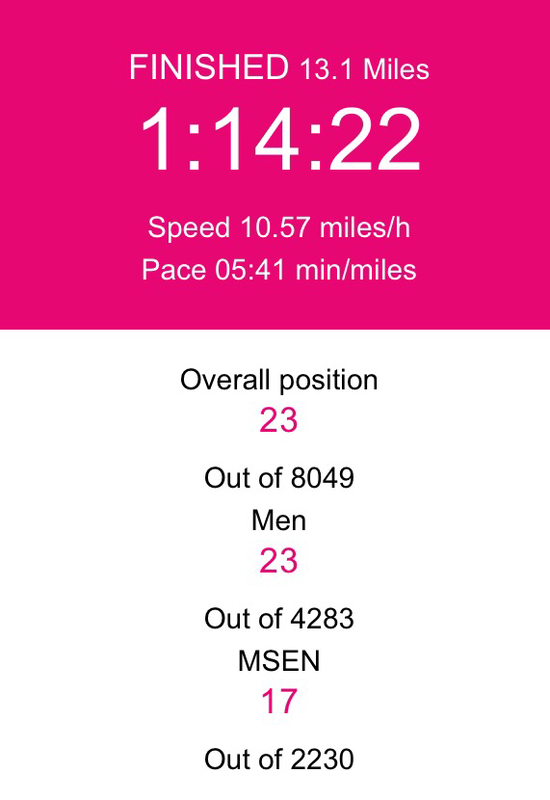 I managed to finish in 58:20 in 235th place, which I am happy with. Hopefully over the next few years I can take part in more cross-country races and improve, I think some specific hill training and more trail running is required. After crossing the finish line I caught up with Lorna and the AR crew and put on some warm clothes. Thank you so much for the support everyone, you made my race really enjoyable. 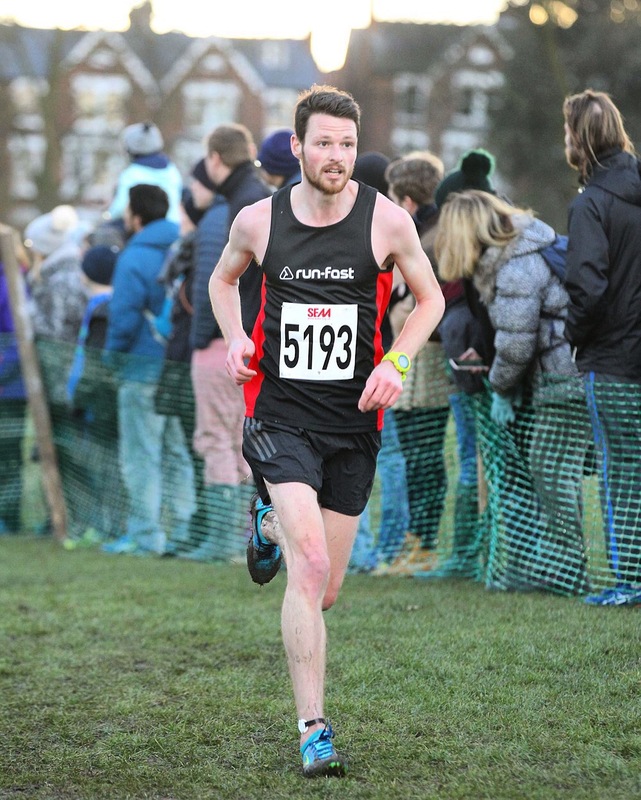 Over the next couple of weeks I’m going to be back running on the road the majority of the time in training for Boston; however I do have the last Surrey XC League fixture on the 11th which I’m really looking forward to. I hope those of you that ran the Southerns enjoyed it as much as I did and I hope everyone’s training is going well for the busy race season ahead. Those of you that follow me on Instagram or Twitter will be aware that throughout December I have been taking part in Advent Running. 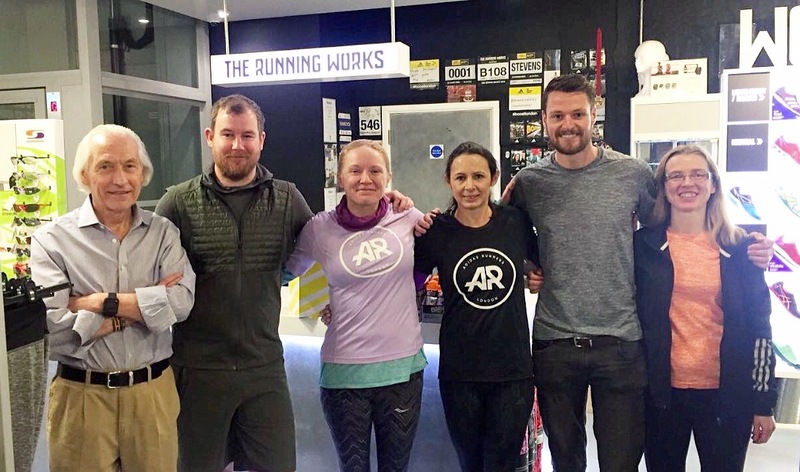 Advent Running is the brainchild of James Poole & Claudia Schroegel; it’s a free and simple challenge that aims to keep people active throughout the busy month of December. The aim is to do 30 minutes of exercise each day whether that is running, swimming, cycling, yoga etc – it doesn’t matter. As I’m predominantly a runner I chose to run for 30 minutes every day, this is my second year taking part as I really enjoyed the run streak in 2015. 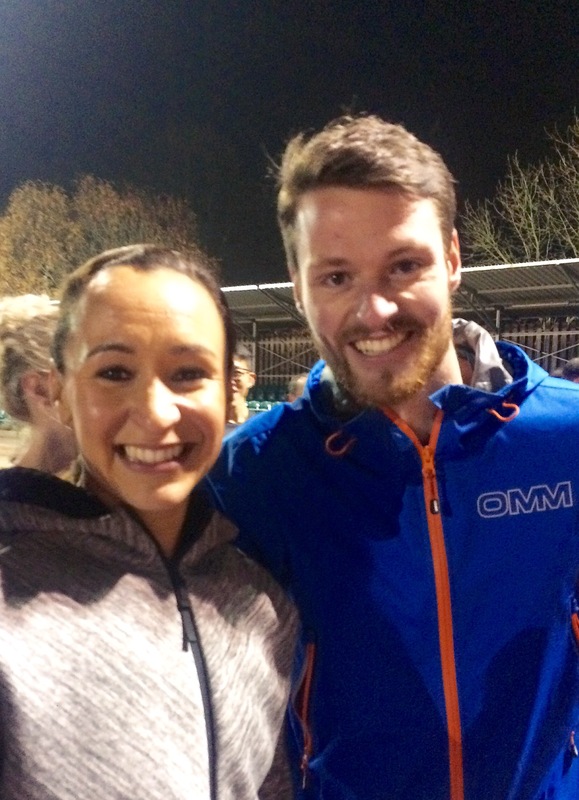 Running isn’t just for Christmas, James and Claudia lead runs and coach sessions throughout the whole year. 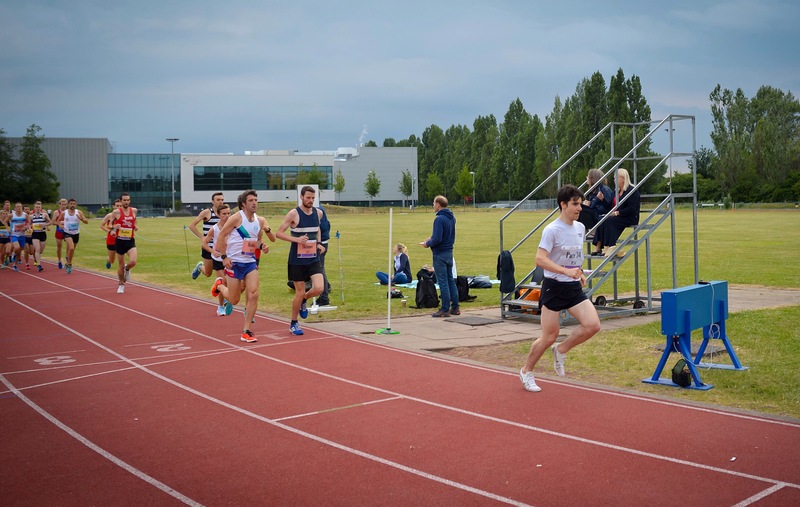 They take a track session on Tuesday nights at Mile End Stadium, starting at 7pm. If running around in circles isn’t necessarily your thing you could join the group on a Thursday morning bright and early to run for bagels. They meet outside Beigel Bake on Brick Lane at 6.45am for a 10kish run around London, taking in the sunrise and city sights. 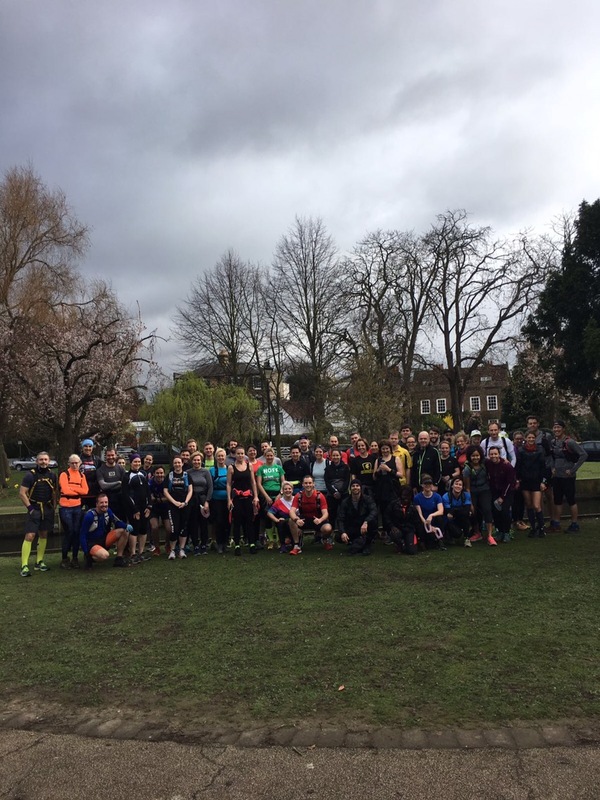 If that wasn’t enough, you can get your long run in with AR, generally a lot of the group train for marathons and so they share the miles together on a Sunday. They meet at 10:30 in the London Marathon Store. 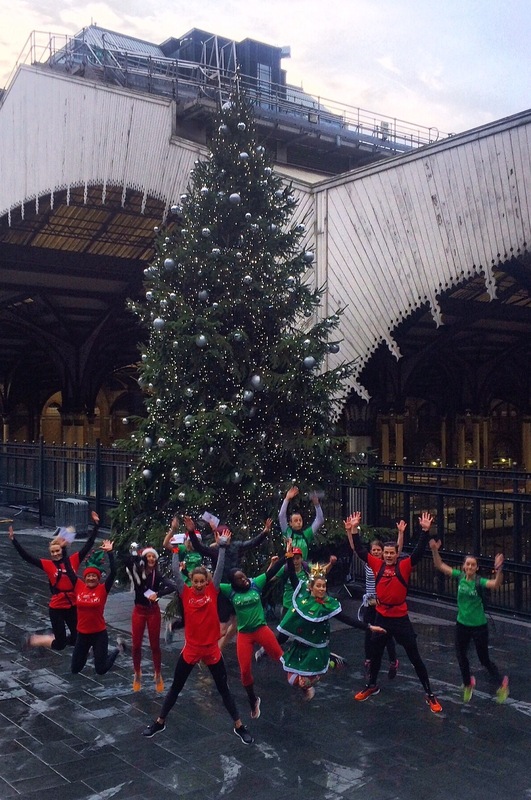 As well as continuing their normal running schedule/structure James, Claudia & the AR elves put on some extra special events in December. 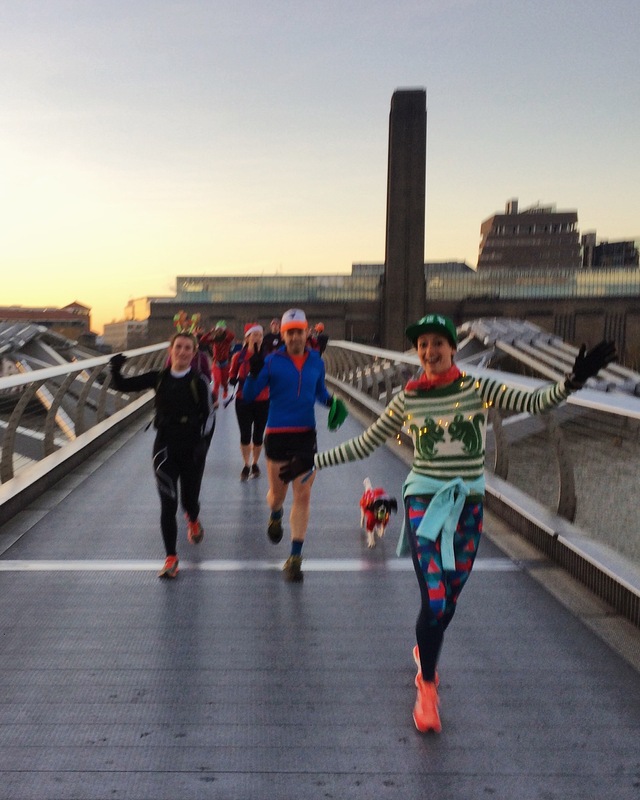 There is always a big launch party, escape the city trail runs, run for pizza events and they put a festive spin on the track sessions (#TrackCheeseday) and the bagel run (run in Christmas jumpers, run for trees etc). These events definitely help me get in the festive spirit, normally I only really feel like it’s Christmas on the day and that’s it. The run streak gets me into a good routine and makes me realise how you can get miles in around work etc. This year’s Advent Running has been a little different to 2015 due to the formation of Adidas Runners. They put on sessions on Monday evenings (normally 6:30pm at London Bridge with James, Noel & Olivia) and Friday mornings (normally 7am at Workshop Coffee with JP & Claudi). Due to it being the off season and there being lots of promotional activities in London, Adidas have been able to invite special guests along to many of the sessions. This has included the likes of Tom Daley, Jo Pavey, The Brownlee Brothers and Jessica Ennis-Hill. 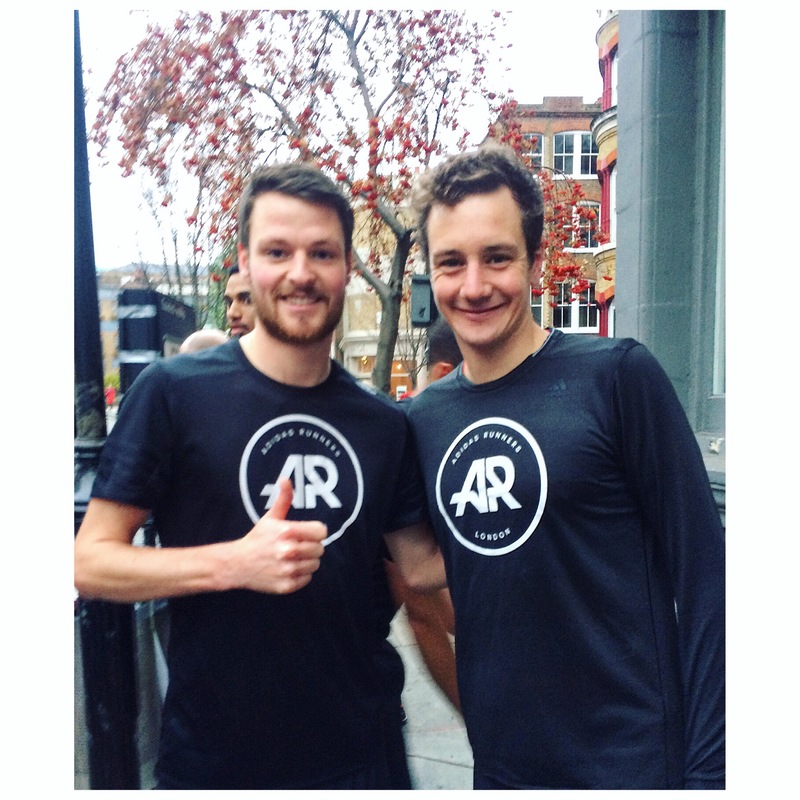 I have been incredibly fortunate to get places for a few of the events; this has meant I’ve been able to chase Jonny Brownlee in a Friday morning Fartlek session and learn some drills from Jessica Ennis-Hill at Battersea Track. Due to working for Run-Fast/at The Running Works I was also really lucky to have a great chat with Jo Pavey over brunch in The Secret Frog Coffee Shop. She’s incredibly inspiring and ridiculously humble. Those of us taking part in the Advent Running streak are on the home stretch, it’s these last couple of days that are the most challenging but I hope everyone can get their 30 minutes in. Advent Running is one of the biggest reasons I decide to run on Christmas Day. 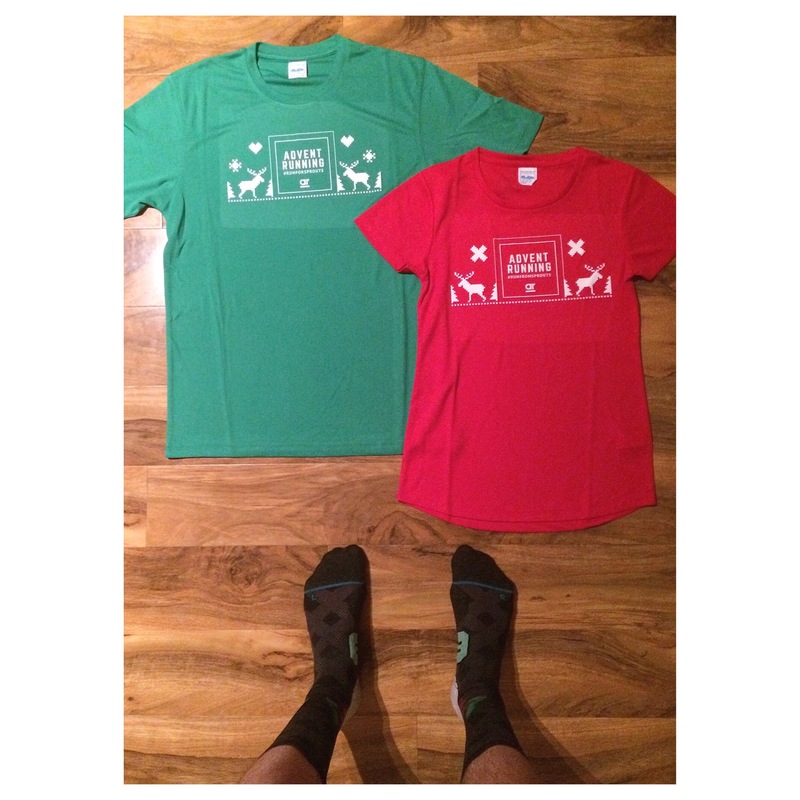 I recently wrote a blog for Iffley Road about “the virtues of the Christmas Day run” you can read it here: https://www.iffleyroad.com/blogs/journal/the-virtues-of-the-christmas-day-run. 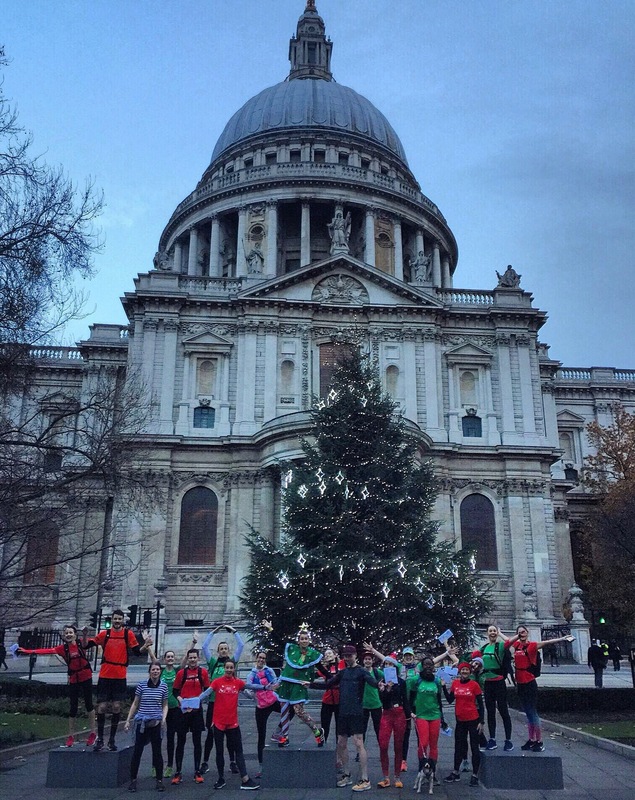 I apologise for writing this blog now if you’re only just finding out about Advent Running, there’s always next year I guess and I’m sure it’ll be even bigger and better (if that’s possible) than ever. If you’re reading this James & Claudi, thank you for thinking of and organising such a great initiative. 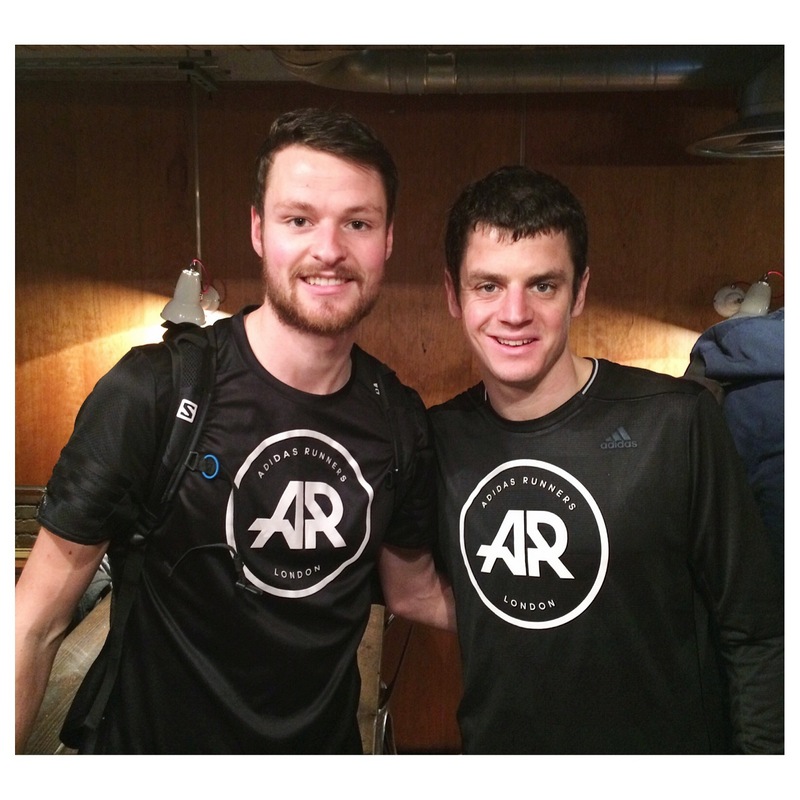 I’m glad you’re sharing your passion for running with everyone and it’s great to see so many people getting involved. Good luck for the rest of the run streak everyone and I hope more people will get involved next year.